Premieres Thursday, June 18 at 8pm on SyFy. Some film-to-TV adaptation make sense. Despite the challenge associated with adapting a classic Coen brothers film, the recently concluded Fargo turned out great, and Jason Katims did a wonderful job of converting Friday Night Lights and Parenthood to compelling dramas. Dominion, however, is a bit of a head-scratcher. 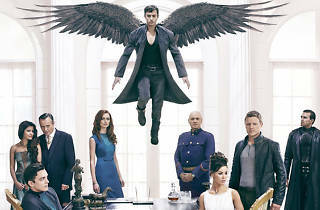 It's based on the 2010 film Legion, about a war between angels and humans, which was hardly a modern classic. Perhaps familiarity with that biblically-themed horror film would make the impenetrably dense mythology of the new SyFy series easier to stomach, but the show struggles to exist on its own merits. A long scroll of title cards sets up the ruined world of Dominion. When God disappeared 25 years ago, it sparked a war between angels and human. 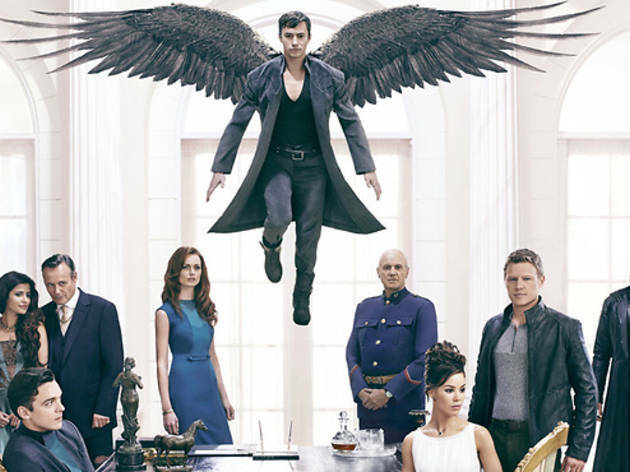 The angels, lead by the archangel Gabriel (Carl Beukes), believe that exterminating mankind will cause God to return, while the archangel Michael (Tom Wisdom) has chosen to defend mankind. The war has caused massive devastation, leaving the remaining humans to gather in fortified cities, the largest of which is Vega, settled over what once was Las Vegas. To maintain order a caste system has been put into place in Vega, leaving two major houses balancing power. General Edward Riesen (Alan Dale) is Vega's benevolent military leader, who was instrumental in humanity's victories against the angels. David Whele (Anthony Stewart Head) is the Secretary of Commerce, a politician bent manipulating himself into controlling Vega. At the center of the story is Alex Lannon (Christopher Egan), who as an orphan was relegated to lowest caste (harsh!) and has taken a job as a soldier to reliably feed himself. Despite his low class, he has friends in high places, including Michael and Riesen's daughter Claire (Roxanne McKee), who intends to ask her father's permission to marry the low-born serviceman. It turns out Alex may have more to offer Vega in its continued fight against Gabriel and his angels. The mythology of Dominion is remarkably dense and the show does an extremely poor job of building out the various interlocking pieces of it in its first hour. Generally, when you spend the first several seconds of a show reading about the world you're entering, you don't expect that you're still going to have to play catch-up. But from the largely undefined caste system to the legend of a Chosen One to explanations of the different types of angels, Dominion constantly trips over its constant exposition. It doesn't help that the ensemble of characters is hopelessly unengaging. Egan, who played a similar character the criminally under-watched Kings (a show that did a much better job of setting an alternate universe), is given very little to work with beyond the broad and familiar strokes of the Hero's Journey. Wisdom, meanwhile, sleepwalks through the role of Michael, failing to capture the complex relationship the character should have with both the humans and the angels. Head is the only one who appears to be having any fun, but as the token bad guy of Vega, his sneers quickly grow tiring. Surprisingly, the show's main villain, Gabriel, goes almost completely unseen in the pilot episode. If there's a thing that a series like this can exist for, it's thrills, but aside from a overly long chase scene and a forgettable sword fight, there isn't much to report. Part of this is due to the fact that the Dominion screener, which was sent out weeks ago, arrived with incomplete effects, substituting what may be sweeping and impressive shots of angels in flight with crude test shots. Still, it's hard to imagine that even the most impressive CGI could make up for the lack of character and effective world-building.